This book is an excellent collectors guide to antique cast iron toy stoves and ranges made mainly in America between 1840 and 1940. It is amazing just how much detail was put into each of these toy and sample stoves. Some of the casting is very intricate and delicate with many extras to go along with the stove such as frying pans and saucepans. This is especially true of the Salesman's samples. These were perfect copies of ranges in a carry case which the salesman would take with him to let him show the product to the customers. Great care was taken with these samples which is why many toys stoves that are advertised as "Salesman's samples" are in fact not - beware. 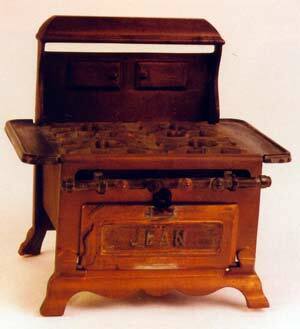 The history of cast iron toy stoves closely follows the history of real stoves. 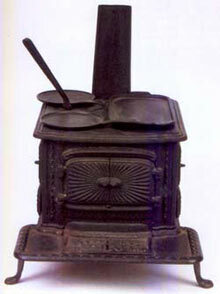 In the 1840's stoves became popular in American kitchen - toy stoves followed suit. 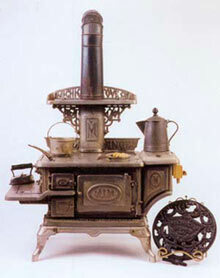 Around the 1880's the range cooker stove began to be used and this is when the toy versions started being made too with many examples shown in the book. In the 1920's gas and electric ranges started becoming popular and smaller versions of these were also made. 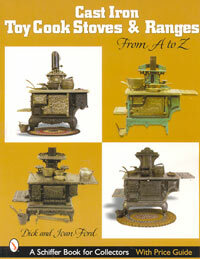 Cast iron toy cook stoves & ranges has an A-Z listing which has guide prices for each stove. This is indispensable for the toy stove collector, but you do not have to be a collector to appreciate this book. The good quality pictures of the ranges and stoves in this book mean that many people will find this book interesting for it's own sake. Where can you get Cast iron toy cook stoves and ranges? Cast iron toy cook stoves and ranges is available online from Bushwood Books. P & P is free within the UK and £5.50 for other surface mail orders. All major cards are accepted as well as sterling cheques.